... is that people are dying for lack of knowledge: children are dying because they are not given simple life-saving interventions like antibiotics for pneumonia or sugar and salt solution for acute diarrhoea. Most of these deaths are in Sub-Saharan Africa and Asia and there are also countless premature deaths in adults which relates again to failure to provide life-saving treatments. Tragically, these treatments are often locally available, but they are simply not provided due to lack of access to basic healthcare knowledge and information. Healthcare Information For All (HIFA) is aiming towards a future where every person will have access to the healthcare information they need to protect their own health and the health of others. HIFA is a global community of purpose – a virtual community of practice where everyone is working together towards a common goal. DGroups uniquely has the functionality and the enabling environment to make this possible. 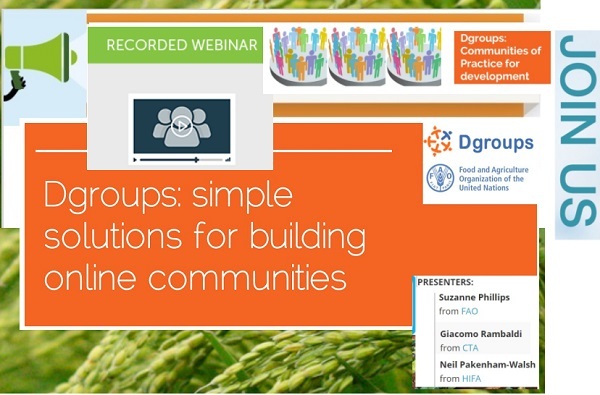 In a recent webinar DGroups: Building Effective Online Communities in Your Organization organized in partnership between FAO-DGroups, Neil Pakenham Walsh - the Coordinator of HIFA and the current Chair of the DGroups Foundation - presented the work that HIFA does and why DGroups is a cornerstone of its success. When HIFA was launched in 2006, it received a letter of support from the World Health Organization (WHO) saying that “Healthcare Information For All is an ambitious goal but it can be achieved if all stakeholders work together.” According to HIFA Coordinator Neil Pakenham-Walsh, DGroups is the best approach that he knows of to bring stakeholders together around a complex development or health challenge. HOW DOES HIFA USE DGROUPS? HIFA has been using DGroups successfully for more than 10 years now. It uses an approach to moderation called Reader-Focused Moderation. This technique focuses on meeting the needs of readers of messages, so every message that goes out on HIFA should be relevant and understandable; if there are any queries, the moderator deals with the author before the message is posted. Every message also includes the author’s profile underneath it, so readers always know where the author is coming from. In terms of approach, HIFA members firstly worked to agree and define the goals of the community. This is paramount in a community of purpose: there needs to be a consensus about the purpose of the community. In a second phase, HIFA members explored the many aspects of how to improve availability and use of healthcare information and indeed many other related aspects of improving quality of care, achieving the Sustainable Development Goal 3, and achieving universal health coverage. To do this, efforts were put into building a critical mass so that HIFA could advocate for better financial and political support for health information provision and use. HIFA has just topped more than 18,000 members, getting about six or seven new members joining every day. The community has been expanding rapidly and without any slow up in the growth at the moment. Besides the main HIFA group, there are currently four other HIFA-related groups:CHIFA, also in English and focusing on child health and rights; HIFA-Portuguese and HIFA-French as language-specific groups; and HIFA-Zambia as country level group. HIFA-Spanish is also about to be launched. More than 300 health and development organizations have officially declared their support for the HIFA vision and about 40 different organizations are funding the initiative. This allows HIFA to run 12 projects including, for example looking at the information needs of community health workers, the information needs of citizens, the information needs of policymakers, and then health specific projects such as family planning with support from K4Health of the Johns Hopkins University. HIFA main strategic partner is the WHO and there are four staff of WHO on HIFA steering group. The main funding partner is the British Medical Association. WHY WOULD HIFA RECOMMEND DGROUPS TO OTHERS? Firstly, it simply works. The CommunityCloud, which is the software that Dgroups runs on, works better than any other tool for communities of practice. Secondly, DGroups is a partnership of United Nations agencies, bilateral agencies, and NGOs – all committed to International Development, human rights, and social justice. DGroups’ three hundred thousand users are primarily driven by wanting to create a better world, in antithesis of the commercial models of the social media giants. More importantly, with a budget of just £50k per annum, HIFA is demonstrating a significant impact. This had been confirmed by the findings of a major external evaluation carried out in 2011 which concluded that HIFA achieves an extraordinary level of activity on minimal resources from which many people around the world benefit. None of this would have been possible without DGroups. To keep up-to-date with AIMS news, please, Sign up for AIMS Newsletter, follow @AIMS_Community on Twitter.